Ensure that your important papers last as long as you need them. 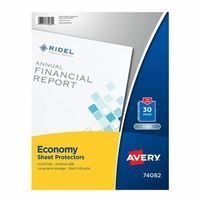 Economy Sheet Protectors provide your documents with quality protection that allows you to view your papers with impressive clarity. A reinforced binding edge anchors the protector in your three-ring binder and resists tearing on the rings. The acid-free and archival-safe material won't stick to your papers, so print stays on your documents rather than clinging to the plastic covering. With these convenient sheet protectors, you can preserve the look and condition of your papers for maximum efficiency. Polypropylene; Archival Safe; 8 1/2" x 11"